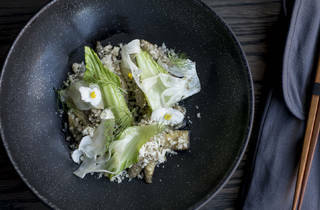 The Alinea Group's departure from traditional fine dining delivers inventive dishes and a fun atmosphere. 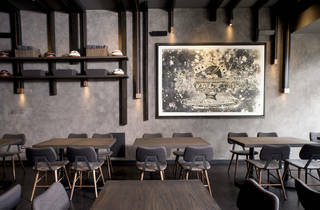 Let’s get this out of the way: Roister is not your typical fine dining establishment. It’s loud, it’s boisterous and you sit at a bar. 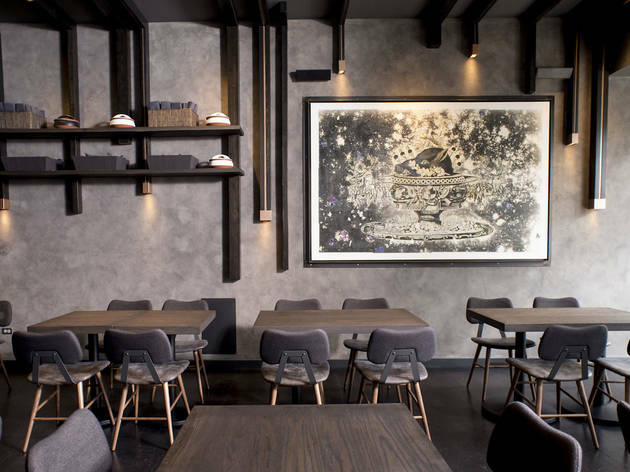 The concept that occupies the former iNG space comes from Alinea’s Grant Achatz and Nick Kokonas, with chef Andrew Brochu (Alinea, EL Ideas). 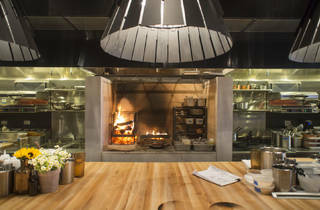 “The kitchen is the restaurant, the restaurant is the kitchen,” is the slogan on the website, a nod to the fact that for the most part, seats surround the open kitchen. There are a few two-top tables and a handful of seats at the liquor bar toward the back. If you can score a reservation, you have the option of the a la carte menu or the chef’s tasting dinner. The chef’s tasting dinner will sit you in front of the open kitchen, whereas the a la carte menu is served in the dining room and back bar. The a la carte menu is packed with small, medium, large and shareable plates. Whatever you decide to order, you need to get the beef broth—a small plate umami bomb with beef cheek and tongue and soft egg in al dente bucatini noodles. Speaking of things you should absolutely get, the chicken you’ve been hearing about is well worth the hype. It’s on the shared courses menu, which serves 2–6. Our server thought it was ambitious for two people. I’d say you could feed three comfortably with it, and four with a few other plates. 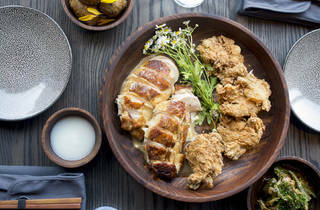 It comes three ways: braised chicken breasts, deboned fried thighs and a chicken salad made with the legs and the wings. The breasts are perfectly braised and juicy, the fried chicken is crunchy and the chicken salad is something I’d love to have on a sandwich every day—fruity, nutty and light. But I’d be willing to bet the experience is what people are lining out the door for. The service is spot on—friendly and informative, and not even the tiniest bit stuffy. 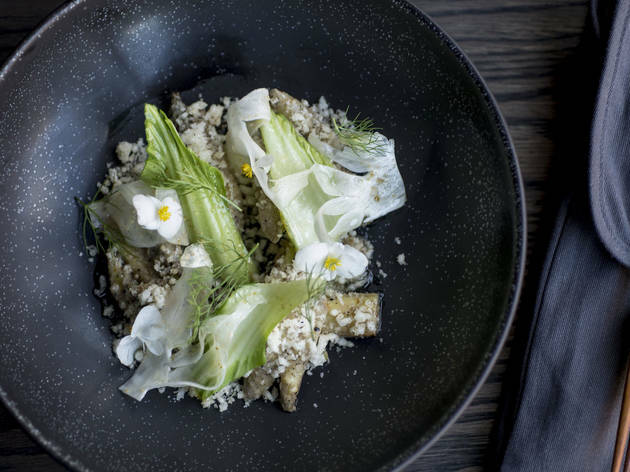 The menu is also cheaper than what you’d find at other Alinea Group spots—and with a lunch service on the way, it will be a great way to try out dishes on par with a three-star Michelin experience without breaking the bank. But it isn’t “bar food;” you’re still getting high-quality offerings that are remarkably delicious, beautifully plated and thoughtful takes on dishes you wouldn’t expect (I mean seriously, who knew chicken would come out three different ways for something that looks pretty singular on the menu?). 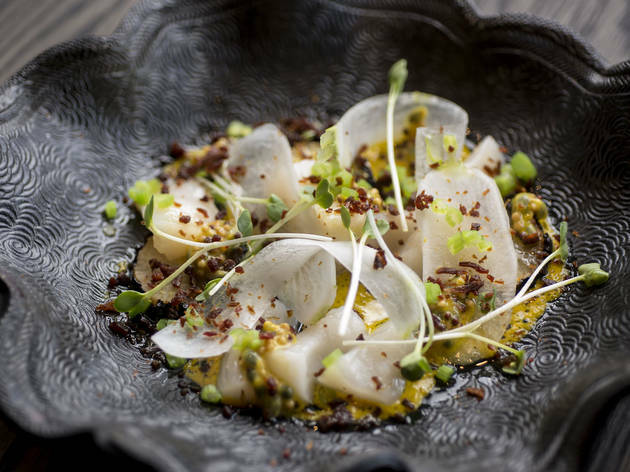 So wear your T-shirt and jeans, go for a rowdy bar experience and try Brochu’s meticulously assembled dishes at a price that doesn’t carry the sticker shock or pretentiousness you’d normally expect from fine dining. Atmosphere: Casual but upscale. Don’t feel like you have to dress up for this dinner. The music is loud, but service is friendly and knowledgeable. What to eat: The beef broth and chicken. The sourdough pancake makes for an intriguing small plate, presented on a sizzling pan with mussels. What to drink: The cocktails are fun and light. My date ordered the Double Daiquiri and I definitely tried to take it from him. The Sour in the Key of Raffi is interesting with a distinct curry taste while still being fruity and light. There’s also a good but short beer list and wine list. Where to sit: Depending on your reservation, you won’t get much say about where you sit, as the seats around the open kitchen are reserved for the chef’s tasting menu. The back bar is fine for cocktail junkies, but if you want a more intimate setting, you should steer toward the two-tops near the front of the dining room. El: Green and Pink line to Morgan Station. Bus: 8. I went here for lunch for my sister's birthday and had a really interesting experience. We had a lot of brunch/lunch options like the fried chicken (amazing) and the avocado toast (exquisite), but for 3 of us with 5 dishes we still left hungry despite spending a lot of money. I guess that's how it goes at higher end restaurants but i was hoping with dishes like this we might get a little bit more full! The quality and presentation and ambiance were all on point though. Roister is my new favorite restaurant. I was there a couple weeks ago, and I am going again tomorrow! 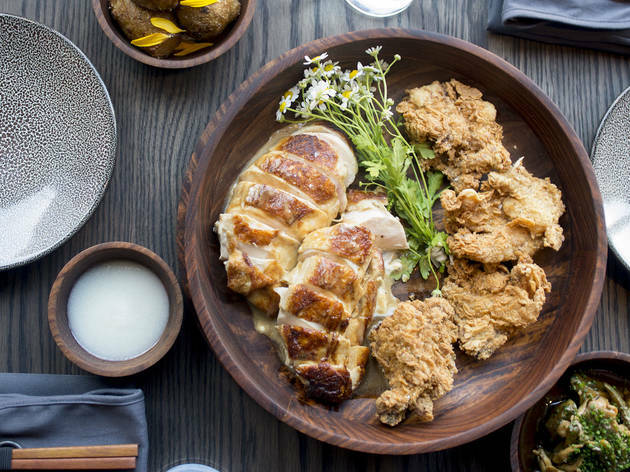 Chicago restaurants are always vying to have the best fried chicken, but Roister wins it all. The dish is a combo of fried chicken and baked chicken, and it was delicious. I recommend going with a group of four so that you can try more foods. We wanted everything on the menu! Roister gave us an amazing dining experience- the food was unreal, service was quick and we had a great time. We did the set menu downstairs and it was worth every penny. That being said, it's not a cheap restaurant but we left feeling not one bit jipped. The fried chicken was probably the best food I've ever eaten so while I may not return for the fixed menu again (seems to be more of a celebration ticket but glad we did it for our anniversary) I would return to order the fried chicken anytime. 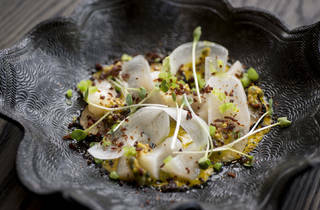 Some of the most interesting and delicious food in Chicago. 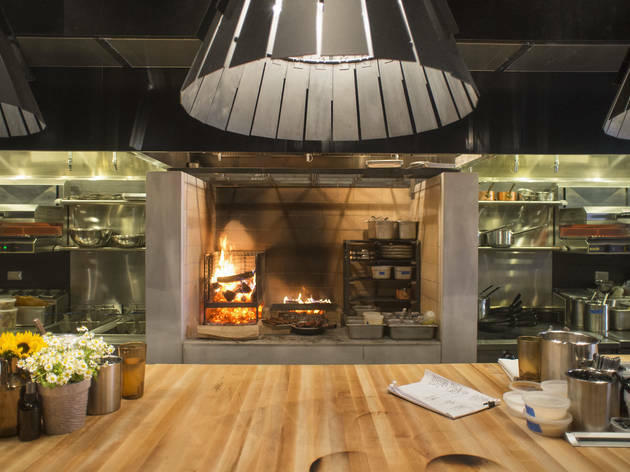 Rock n Roll, kitchen table seating where you can watch the chefs compose your plate, and you don't have to spend a month's rent!